Site-wide elements are the items that appear on every page, and are identical on every page. Site-wide elements are categorized into Header, Navigation and Footer regions. The header appears at the top of every page. You may choose the color of the "roof" (the top-most bar with the university's wordmark) to be white, red, or dark gray. In addition to the department or group name, configurable options are available for other elements. Navigation provides the functionality to traverse a site using menus that are available on every page. Navigation is automatically generated as you build your site; however, configuration options are available such as where an item should appear. Navigation is provided in several regions of a page. Side navigation is a slide-out menu that is either open or closed per-page depending on several factors. It can be opened manually using the hamburger menu and closed using the X at the top right. The department or group name at the top is a clickable link to the site's home page. If a navigation item contains subpages, clicking on the arrow near the item will expand the menu. 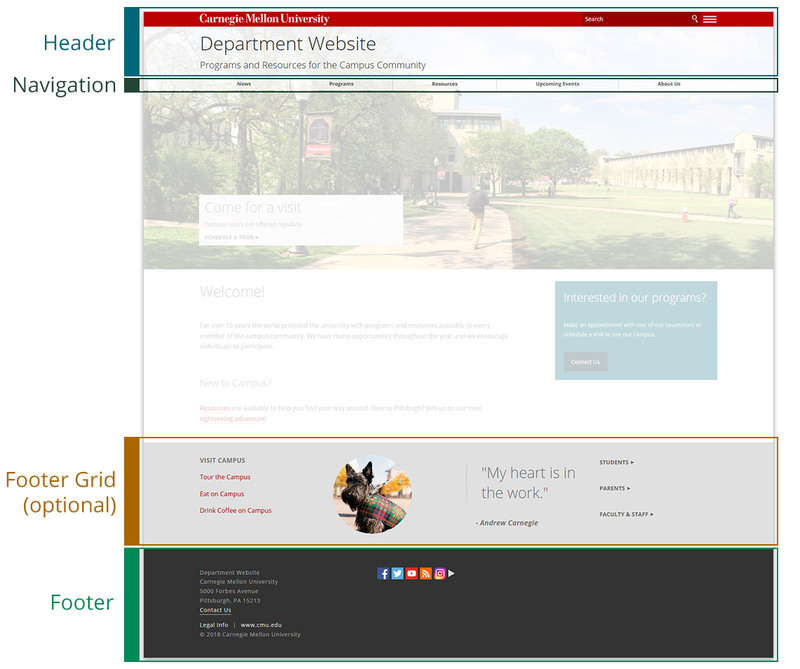 The footer grid appears near the bottom of every page immediately above the lower footer. It is ideal for providing content that is easily accessible throughout your site, such as important links. The footer is the bottom-most region of every page. Configurable elements include contact information and social media.